This simple little dessert is elegant, light and tastes delicious. Variety of Fresh Fruit, cut into bite sized pieces. In a small mixing bowl add the Plain Yogurt and Honey. Mix together well and add Rum a little at a time to reach a pleasing consistency. Refrigerate for a few minutes (or longer) while you prepare the fruit. Cut into bite sized pieces fresh fruit such as strawberries, bananas (sprinkled with a little lemon juice to prevent browning), pineapple (fresh or canned), orange slices, peaches, or plums. To not overwhelm your taste buds, limit your choices to three, four max, fruits. There is no limit to the combinations and flavors you can develop with this Sweet Treat. 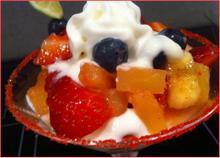 To reflect tropical flavors we used strawberries, bananas and orange bits with a couple of blueberries for a color pop. Next time we will sprinkle a little coconut over each layer. You may want to substitute Chambord or Grand Marnier for the Rum. If you do not enjoy alcohol, leave it out or use a little orange juice in its place. 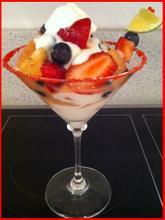 Begin with one to two spoonfuls of flavored yogurt, then add a layer of fruit, then yogurt. Continue layering until your glass is full, ending with a layer of fruit. Using a toothpick or decorators' pick, thread three or four pieces of fruit. Add it to one side of the glass to suggest the olives served with a Martini. Finish with a swirl of whipped cream. Sprinkle with chopped nuts, if desired. Tips: If you don't have Martini glasses, use any pretty glass that you have in your cupboard. Wine glasses would be lovely, or a glass bowl, even a glass cup.